RTSL | Finishing Half-Life is just the beginning! The Map Labs team keeps cranking out quality mapping challenges. This time they approached me to ask about a crossover challenge and I suggested a sequel to the namesake contest RunThinkShootLiveVille. That was a fun challenge to run and play, and some memorable maps were entered. 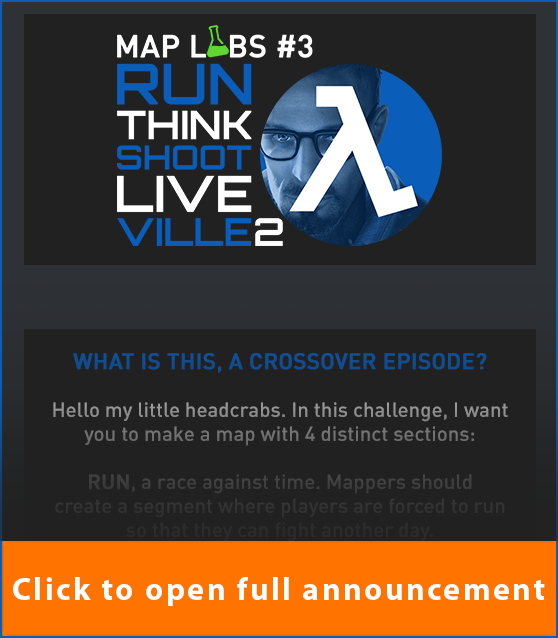 So for this first crossover with Map Labs, the theme was to make a map featuring the sections Run, Think, Shoot, Live – in any order. The challenge recieved 12 entries and 2 bonus maps, here they are! 29 Comments and 5 recommendations, most really enjoyed it! This old lab complex was already tricky to navigate. Now, with the facility on lock down and rapidly descending into chaos, the most direct routes are blocked and you will have to find alternate ways to reach the surface. E-Lab-orate was created for TWHL’s 20th Anniversary Competition. 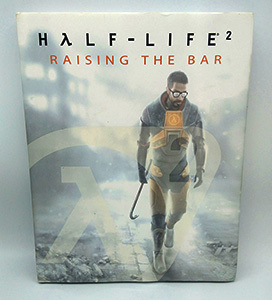 6 Comments and 3 recommendations, say ""
Half-Life: Anti-Climax is my take on the “battle you have no chance of winning” the G-Man offers you once you decline his job offer at the end of the Half-Life campaign. Is there truely no chance to win or can you lead Gordon to victory and freedom? 21 Comments and 9 recommendations, most say "Play It Now!" Hey, you didn’t really think we’d never have another Ville challenge, right? Geez Louise! Chris & Toki (the Map Labs folks) have really stepped up, filling the void that RTSL left once we started to wind things down late last year. This is the third “full” Map Labs Challenge – though they’ve run a couple of Test Tube (smaller) challenges in the vein of the Experimental Mapping Challenges here. Most of them are available right here on RTSL, and all are on the Map Labs ModDB page. The Map Labs Discord just opened up for business. Head there to keep up with Map Labs, find out about new challenges, and maybe volunteer as a beta tester! 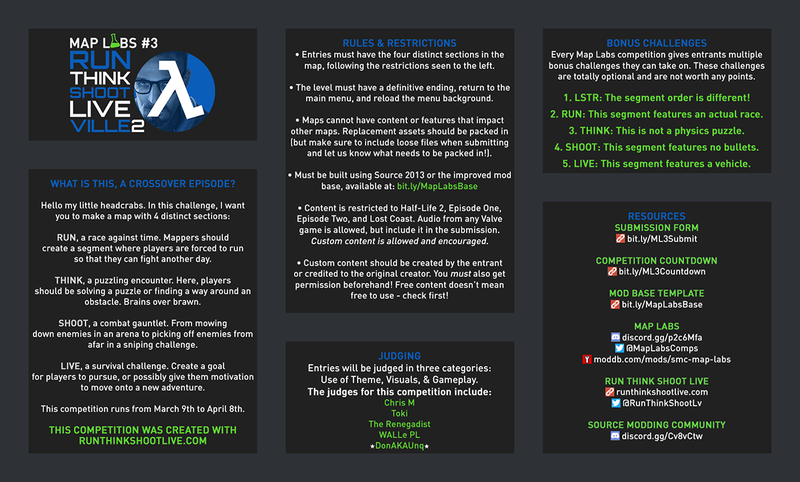 And be sure to join the Source Modding Community Discord if you’re thinking of mapping for any of the Map Labs Challenges, or if you just want to talk modding for just about any Valve game. Note the optional Bonus Challenges, just to add some spice to the maps. Map Labs typically doesn’t have prizes for the challenges, other than special roles on the SMC Discord server for placing in the top 3. But I happened to have a spare copy of Raising the Bar in decent shape kicking around, so I’m offering it up to the winner. Waking up in a mine-turned-rebel base during an attack, you have to reach the surface and rid the base of intruders en route – but even if you make it, your chances of escape are getting slimmer by the minute. So grab a gun and do what you can before the site gets sealed off! I made this map for TWHL’s “Ascension” Mini Competition. 11 Comments and 4 recommendations, 2 say "Maybe?" For Valentine’s Day, the Source Modding Community Discord announced a short mapping challenge. This one was a Test Tube, which means it only ran for a few days instead of the typical 3 weeks. The theme was to make a map featuring a companion or sidekick character. Bonus challenge for creating the map with a companion as well! The challenge recieved 7 entries and 1 bonus map, here they are! This is the latest Source Modding Community Discord mapping challenge to release. The theme this time was Episode One – make a map that pays homage to the underrated Half-Life 2: Episode One. The challenge recieved 7 entries, here they are! 20 Comments and 4 recommendations, most really enjoyed it! A town close to yours has been shelled a while ago. The Combine have settled there, with a small base. Such a small base doesn’t seem harmful, but you think something else is going on. This is my first map so any feedback is appreciated. Many thanks to Strontvlieg, Lyren and Spoops for playtesting. 14 Comments and 8 recommendations, most say "Play It Later"
The Lambda Cup 2018 consisted of five mapping challenges, each with a different theme. Entrants received points for each challenge they enter. At the end of the event, the best 3 points totals from the challenges they entered were added together for each entrant. These totals decided who won the Grand Prizes. Read to find out who took the top 3 prizes – and we announce a couple of special prizes! The Source Modding Community Discord server has started running mapping challenges of their own. So far the challenges have all been single player HL2: Episode 2 maps (actually running on an improved SDK 2013 version), so they’re definitely worth keeping an eye on! This challenge was a “Test Tube” challenge – a 72-hour weekend challenge with the theme of One Room – the entire map should be set in one room. The challenge received a solid 16 entries, and here they are! 18 Comments and 2 recommendations, say ""